The article in the winter 2017 Medicine at Michigan intrigued me [“Let’s Talk About the Pelvic Floor”]. I honestly believe that more women than you realize are talking about this — but to each other, not to their doctors, unfortunately. At age 28 and age 30, I had two natural childbirths, with the second one resulting in extensive tearing. I experienced a severely prolapsed uterus in my mid-40s, which was followed by a full hysterectomy and cystocele and rectocele repair in 2000. If I had known before the surgery what I experienced six months after the surgery (and ever since then), I never would have agreed to the surgery. My urinary incontinence issues prior to surgery were minimal and increased significantly afterwards. Let’s just say that I sincerely hope treatment is better than it was 17 years ago — but based on what I was reading in the article, I’m not 100 percent convinced that is the case. Now, as I approach 70 years of age, my life revolves around “bathroom issues” — and I have to say it gets really, really old! However, I really think there’s also a genetic component to these issues since my maternal grandmother, mother and sister had similar issues, and my older daughter also is in the early stages of the same problems. Please continue your research; I hope that other women have more positive experiences trying to ameliorate these conditions better than I. And thank you for bringing the issue “out in the open.” Let’s just hope that more women speak up — and not just to each other, but to their doctors as well. Let me tell you a sort of “It’s a Small World” story. 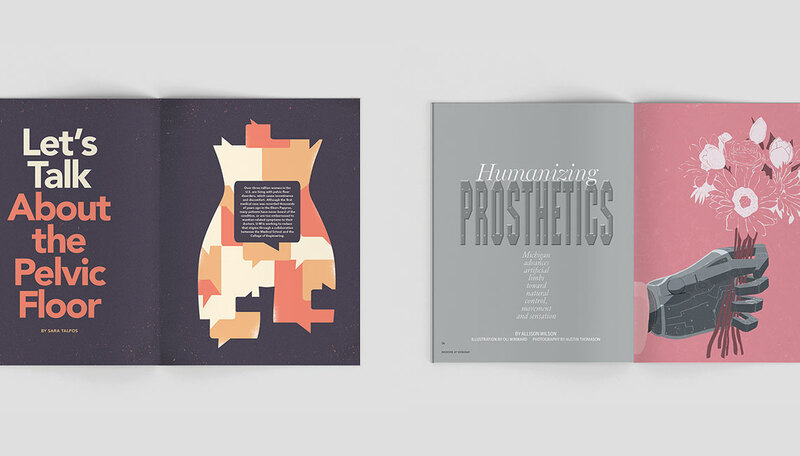 When I saw the summer 2015 issue, I was surprised to see Dr. Paul Cederna’s work, because some 40 years ago I was engaged in similar work to develop electric arms for children with thalidomide embryopathy, in particular kids with deficient or short arms. For them, I established a research group to develop electric arms in collaboration with the engineering department of Tokyo University. Mechanically, we came up with elaborate arms with three degrees of freedom (three different motors), but we met considerable difficulty controlling them simultaneously. Unfortunately, the project met a severe financial difficulty and had to be discontinued. I found a kind of hope reading the article in the Medicine at Michigan issue dealing with body-machine interface by Dr. Cederna. I sent the article to the president of the Japanese Society for Surgery of the Hand (JSSH), Prof. Akimasa Hirata of the Nagoya Institute of Technology, who has been interested in similar projects. He got in touch with Dr. Cederna and invited him to the 60th JSSH annual congress held in April 2017 in Nagoya and asked me to chair the session. I am a retired professor of orthopaedic and hand surgery in Tokyo, aged 85 years, past-president of the 25th JSSH and past-president of IFSSH (International Federation of Societies for Surgery of the Hand — what a tongue-biting name!). What I should like to tell you is this: Medicine at Michigan created this old and new U-M union. Exciting, isn’t it? It is certainly a small-world story.